A few years ago Dave and I decided that we would get a new side by side freezer/fridge for our joint Christmas present. The one I wanted will not fit into our new kitchen and so I had to settle for something different. It works well for the OCD part of me as the freezer drawers are marked – meat, chicken, fish, vegetables and ICE CREAM! It has a DIY ice maker and loads of freezer space. Given that I like to cook in rotation: meat, chicken, fish, vegetarian – the freezer works really well for me. I buy my meat and chicken as needed, and in bulk and then I freeze in portions. I then take out the protein we are having, and the meal we end up eating is decided by the protein we have out. The day after I made the coriander pesto, we had chicken on the menu, and so I decided to use the two ingredients to create this dish. This sounds really delicious! I love cilantro and really should try making my own pesto with it also. please let me know how it works out 🙂 Thanks for visiting! This looks extraordinary and brilliant. Simple to prepare and a delight to eat. My freezer could well do with some labelling… and dinner looks delicious! I could come over and help …. I could come and visit and help sort it all out! My kind of meal, actually I had pesto pasta salad and chicken for lunch, sadly from a shop – should make pesto more often, and I miss my basil bush! Keep well! you should plant some basil at Bev’s! Thanks for stopping by my blog–hope you’ll join in the canning party! And I love the idea of a coriander-based pesto (although I’d be adding it to my tofu–does your freezer have a drawer for that? 😀 ). It’s a beautiful fridge and I would steal it if I could! is your suitcase big enough?? Am still stuck on the bit where you said your freezer has a DIY ice cream maker…wow!!!!! 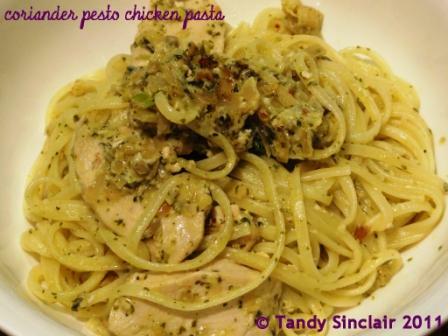 Love the way you used the Coriander pesto – looks lovely. Sounds absolutely delicious. I must try this. Oh! I’ll never resist a plate of pasta and pesto sauce, and with the extra bonus boost of protein..you have a winner dish! Just Delicious!